I discovered Audrey Louise Reynolds in a book I recieved for Christmas called 'Fashionable Selby', which is Todd Selby's debut fashion book. The book explores various creatives in the world of fashion, including designers, boutique owners, stylists and more. Audrey Louise Reynolds is an organic dyer, painter, gardener and artisan, in short she describes this as: 'I work in colour'. I'm fascinated by the way she uses natural resources and elements to customize simple garments. Used pigments include squid ink, flowers, beetroot, coral and really anything you can extract colour from. 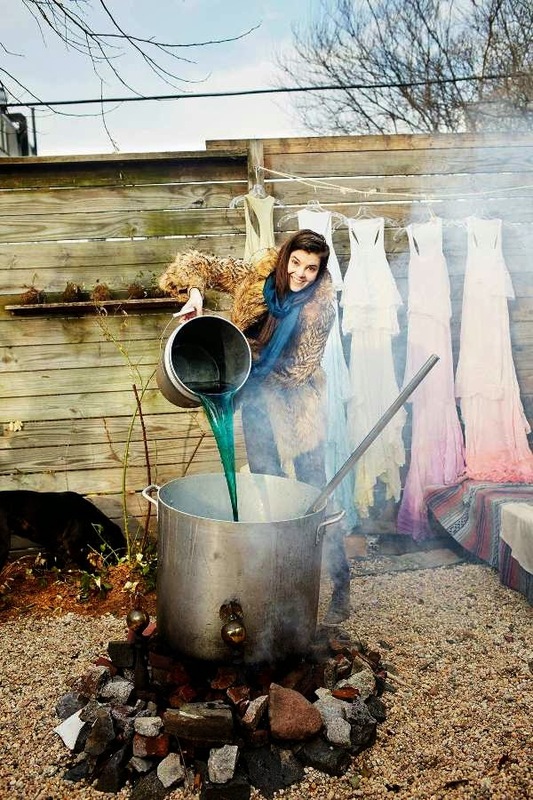 She also processes the dye using the elements, so dragging through the garments through the sea, burning them and occasionally burying them for a short period of time to let them age naturally. Her techniques are so original and I definitely want to give organic dying a try. Upon researching, I found this excellent short film which coincides with her section in the book. It really captures her methods and lifestyle so beautifully. If you want to see the items she sells, check out her website HERE. Hope you all had a lovely Christmas. I really enjoyed taking a few days off blogging to spend time with family and get some fresh ideas. Can't wait to share them with you all soon. Wow! Its a very inspiring post, I keep it, thanks for share! You have a nice blog dear, what about following each other? Wow this is such a cool post, the book looks really intresting! Thanks, yes it's really cool! wow this is really cool. the colors of the dresses are perfect, nice and light.